Humana Press is no longer the publisher of this journal for 2008. For questions regarding your subscription please contact the ASCMSO society directly. Annals of Ophthalmology offers practitioners a deeper understanding of ophthalmic disorders, diseases and conditions. Offerings include original articles, case studies, reviews and editorials. 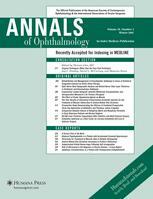 Coverage includes diagnosis, management and treatment of, among others, post-cataract surgery endophtalmitis, retinal detachment due to macular hole in high myopia, proliferative vitreoretinopathy, central Eales disease, lead poisoning, infectious crystalline keratopathy and endophthalmitis, orbital hydatid disease, branch retinal artery occlusion, amniotic membrane grafting for conjunctival defect, acute comitant strabismis after chalazion incision, pseudophakic glaucoma after clear lens extraction for high myopia, orbital tuberculosis, and linear nevus sebaceus syndrome.